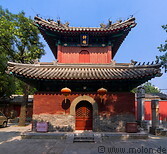 The Dongyue temple (北京东岳庙, Běijīng Dōngyuè Miào in Chinese) is a Chinese Taoist temple located in in the Chaoyang dsitrict of Beijing, a few km east of the Forbidden City and 500m east of the Chaoyangmen subway station. It was first built in 1319 during the Yuan dynasty and occupied an area of more than 6 ha during its peak period. It is the largest Taoist temple of the Zhengyi school. 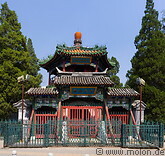 The temple of Confucius (北京孔庙, Běijīng Kǒngmiào in Chinese) is the second largest Confucian temple in China, after the one in the Confucius' hometown of Qufu. Originally named as Guo Zi Jian (the Imperial College), it was the place where the emperors offered sacrifices to Confucius. The construction of the temple started in 1302 during the Yuan dynasty and was completed in 1306. The temple has an area of 2.2 ha and contains three rows of houses and courtyards. The Fayuan temple (法源寺, Fǎyuán Sì in Chinese) is a Buddhist temple located a few km southwest of the Forbidden City. First built in 645 AD during the Tang dynasty, it was later rebuilt between 1436 and 1449 during the Ming dynasty. The temple occupies an area of 6700 m². The Niujie mosque (牛街礼拜寺, niújiē lǐbàisì in Chinese) is located in the Niujue area, southwest of the Forbidden City. It is the eldest mosque in Beijing having been first built in 996 during the Liao Dynasty (and later enlarged during the Qing dynasty in the 17th century). It covers an area of 1 ha and is built in Chinese and Islamic style.